If you know me, or have read my previous post, you know that I worked for a very interesting company before joining Toptal. At this company, our payment provider processed transactions in the neighborhood of $500k per day. Part of my job was to make our provider PCI-DSS compliant—that is, compliant with the Payment Card Industry – Data Security Standard. It’s safe to say that this wasn’t a job for the faint of heart. At this point, I’m pretty intimate with Credit Cards (CCs), Credit Card fraud and web security in general. After all, our job was to protect our users’ data, to prevent it from being hacked, stolen or misused. You could imagine my surprise when I saw Bennett Haselton’s 2007 article on Slashdot: Why Are CC Numbers Still So Easy to Find?. In short, Haselton was able to find Credit Card numbers through Google, firstly by searching for a card’s first eight digits in “nnnn nnnn” format, and later using some advanced queries built on number ranges. For example, he could use “4060000000000000..4060999999999999” to find all the 16 digit Primary Account Numbers (PANs) from CHASE (whose cards all begin with 4060). By the way: here’s a full list of Issuer ID numbers. At the time, I didn’t think much of it, as Google immediately began to filter the types of queries that Bennett was using. When you tried to Google a range like that, Google would serve up a page that said something along the lines of “You’re a bad person”. About six months ago, while reminiscing with an old friend, this credit card number hack came to mind again. Soon-after, I discovered something alarming. 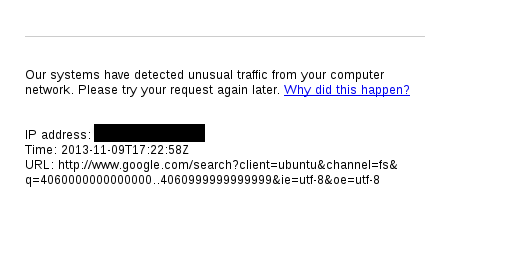 Not terribly alarming, but certainly alarming—so I notified Google, and waited. After a month without a response, I notified them again to no avail. With a minor tweak on Haselton’s old trick, I was able to Google Credit Card numbers, Social Security numbers, and any other sensitive information of interest. So I notified Google, and waited. After a month without a response, I notified them again to no avail. With a minor tweak on Haselton’s old trick, I was able to Google Credit Card numbers, Social Security numbers, and any other sensitive information. Yesterday, some friends of mine (buhera.blog.hu and _2501) brought a more recent Slashdot post to my attention: Credit Card Numbers Still Google-able. The article’s author, again Bennett Haselton, who wrote the original article back in 2007, claims that credit card numbers can still be Googled. You can’t use the number range query hack, but it still can be done. Instead of using simple ranges, you need to apply specific formatting to your query. Something like: “1234 5678” (notice the space in the middle). A lot of hits come up for this query, but very few are of actual interest. Among the contestants are phone numbers, zip-codes, and such. Not extremely alarming. But here comes the credit card hack twist. I was curious if it was still possible to get credit card numbers online the way we could in 2007. As any good Engineer, I usually approach things using a properly construed and intelligent plan that needs to be perfectly executed with the utmost precision. If you have tried that method, you might know that it can fail really hard—in which case your careful planning and effort goes to waste. In IT we have a tendency to over-intellectualize, even when it isn’t exactly warranted. I have seen my friends and colleagues completely break applications using seemingly random inputs. Their success rate was stunning and the effort they put into it was close to zero. That’s when I learned that to open a door, sometimes you just have to knock. The previous paragraph was a cleverly disguised attempt to make me look like less of an idiot when I show off my “elite hacking skills”. Oops. First, I tried several range-query-based approaches. Then, I looked at advanced queries and pretty much anything you might come up with in an hour or so. None of them yielded significant results. And then I had a crazy idea. What if there was a mismatch between the filtering engine and the actual back-end? What if the message I got from Google (“You are a bad person”) wasn’t from the back-end itself, but instead from a designated filtering engine Google had implemented to censor queries like mine? It would make a lot of sense from an architectural perspective. And bugs like that are pretty common—we see them in ITSEC all the time, particularly in IDS/IPS solutions, but also in common software. There’s a filtering procedure that processes data and only gives it to the back-end if it thinks the data is acceptable/non-malicious. However, the back-end and the filtering server almost never parse the input in exactly the same way. Thus, a seemingly valid input can go through the filter and wreak havoc on the back-end, effectively bypassing the filter. Search for this and Google will be happy to oblige: “0xe6c8c69c9c000..0xe6d753e6ecfff”. The only thing you need to do is to convert credit card numbers from decimal to hexadecimal. That’s it. Humongous CSV files filled with potentially sensitive information. Sensitive information shared on hacker sites (and even Facebook). Anyone who’s interested and motivated will have figured this out by now. To quote Haselton, if the big players aren’t taking responsibility and acting on these exploits, then “the right thing to do is to shine a light on the problem and insist that they fix it as soon as possible”. This trick can be used to look up phone numbers, SSNs, TFNs, and more. And, as Bennett wrote, these numbers are much much harder to change than your Credit Card, for which you can simply call your bank and cancel the card. 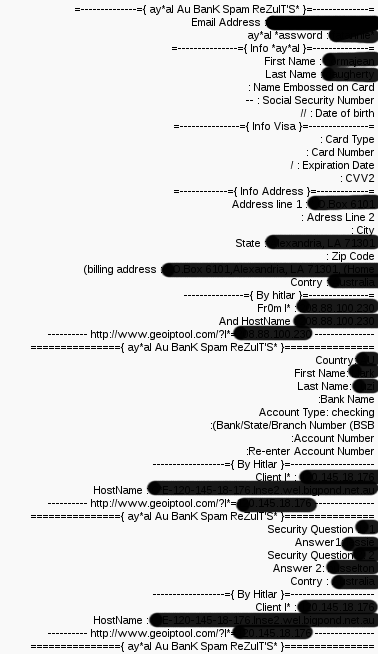 WARNING: Do NOT Google your own credit card number in full! 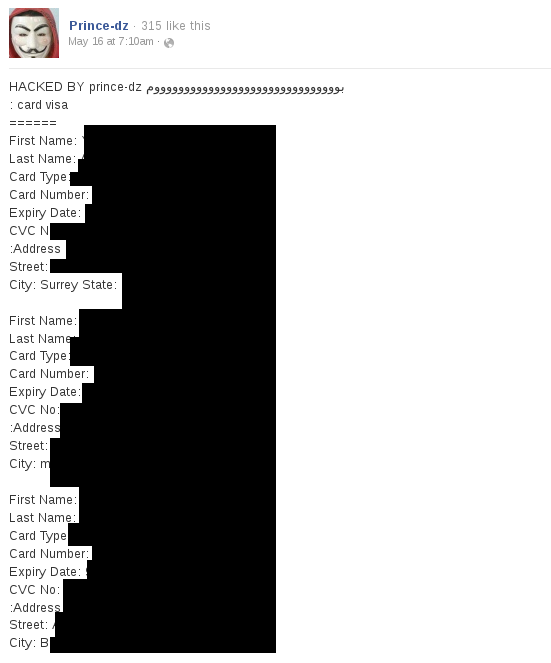 If you find anything very alarming, or if you’re curious about credit card hacking, please leave it in the comments or contact me by email at [email protected] or on Twitter at @synsecblog. Calling the police is usually futile in these cases, but it might be worth a try. The given merchant or the card provider is usually more keen to address the issue. Well, Google obviously has to fix this, possibly with the help of the big players like Visa and Mastercard. In fact, Haselton provides a number of interesting suggestions in the two articles linked above. What you need to do, however (and why I’ve written this post), is spread the word. Credit Card fraud is a big industry, and simple awareness can save you from becoming a victim. Further, if you have an e-commerce site or handle any credit card processing, please make sure that you’re secure. PCI-DSS is a good guideline, but it is far from perfect. Plus, it is always a good idea to Google your site with the “site:mysite.com” advanced query, looking for sensitive numbers. There’s a very, very slim chance that you’ll find anything—but if you do, you must act on it immediately. And a few general tips: don’t download things you didn’t ask for, don’t open spam emails, and remember that your bank will never ask for your password. By the way: If you think there’s no one stupid enough to fall for these credit card hacking techniques or give away their credit card information on the internet, have a look at @NeedADebitCard. This article was written by Gergely Kalman, a Toptal Security Specialist.